Forget the creamy sauces and keep it tomatoey. Tomatoes are bursting with vitamins A and C to boost your immunity. 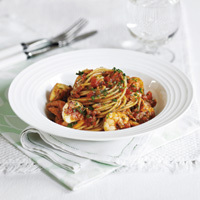 Our shortcut for busy cooks is to use a pot of tomato salsa to coat the pasta. Boil the spaghetti in a large pan of boiling salted water for 8 mins. Meanwhile, put the tomato salsa into a large bowl. Add the olive oil, balsamic vinegar and sunblush tomatoes.